China Shipping Container Lines Co., the country’s second-biggest shipping company, have ordered the world’s biggest container ship, taking over the title from A.P. Moeller-Maersk A/S. Hyundai Heavy Industries Co. will build five vessels each capable of carrying 18,400 20 foot containers for $700 million for China Shipping, with delivery starting in the second half of 2014. Shipping lines, including Maersk and Evergreen Group, are adding bigger vessels that burn less fuel and have lower emissions to reduce costs. Maersk next month will take delivery of the world’s biggest container ship, The Triple-E, which can carry 18,000 20 foot shipping containers (teu), from Daewoo Shipbuilding & Marine Engineering Co. The ships Hyundai Heavy will deliver to China Shipping will use an engine that can automatically control fuel consumption to suit speed and sea conditions, helping to improve fuel efficiency, reduce noise and cut emissions. Hyundai Heavy, the world’s biggest shipbuilder, has received $9.7 billion of contracts for ships and offshore projects this year including the latest order. 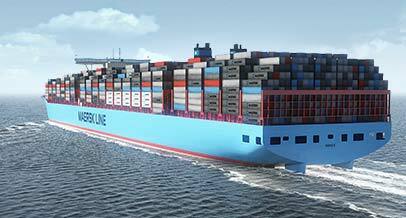 Maersk ordered 20 ships of the type that can each carry 18,000 teu in 2011, which was the world’s biggest then. Five of the vessels are scheduled for delivery this year with the first to be launched 28 June 2013. CMA CGM SA, the world’s third-largest container shipping company, operates the biggest vessel in operation, which can carry 16,000 teu. This entry was posted in Blog, Container facts and tagged 20 foot shipping conatiners, world's biggest container ship.